Your heart is racing, you’re having trouble breathing, you feel dizzy and shaky, anxious thoughts and fear have filled your head… Are you having a panic attack? What is a panic attack? If you've simultaneously had four of the 13 symptoms listed here, you've experienced one. A panic attack is an abrupt feeling of overwhelming anxiety or fear. It typically comes upon a person within a few minutes, and includes at least four of the 13 symptoms below. Panic attacks usually occur in individuals who have experienced long periods of stress. The stress can be due to life events (grief, loss, chronic worry, financial problems) or from intense fears called phobias. Agoraphobia is an anxiety disorder that manifests as fear of situations where escape could be difficult (being in an elevator, airplane, a subway, or a large crowd, for example) or situations where fear occurs in open spaces (e.g., being outside your home alone). A person who is afraid of being trapped in an elevator, for instance, may have a panic attack as soon as he or she enters a tall building. Social phobia, or social anxiety disorder, is an extreme fear of being judged negatively or rejected in a social situation (think stage fright). This person would be apt to experiencing a panic attack when called upon to make an announcement or give a speech in front of a large crowd. Panic attacks also occur due to generalized anxiety disorder or panic disorder. Generalized anxiety disorder is a feeling of anxiety, stress, or worry that does not go away and tends to get worse over time. Panic disorder is a type of anxiety disorder where sudden feelings of terror can occur without warning. In both anxiety or full-blown panic disorder, an imbalance of the brain chemical—serotonin—may be to blame. 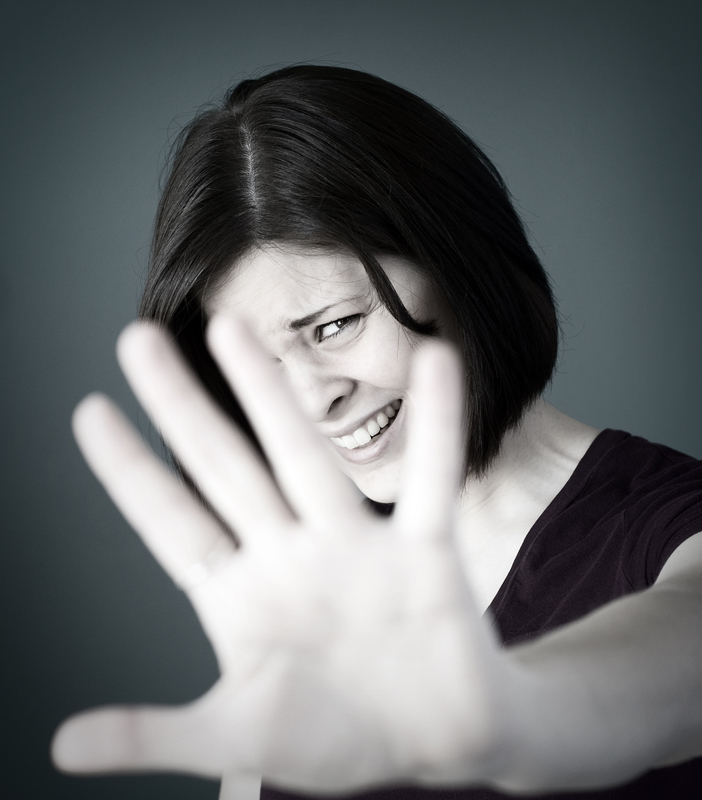 It has long been known that women more often than men suffer from generalized anxiety disorder. In fact, women are twice as likely as men to have a panic attack. Why? Men and women use serotonin differently. In general, women are highly susceptible to decreases in this neurotransmitter and demonstrate multiple symptoms. However, when men experience a decrease in serotonin, it often does not translate to depression and anxiety. First, recognize any life stressors that may be contributing to chronic worry or stress… and do something about it. Eliminate stressors where you can. Find another job, take 10- to 15-minute “calm” breaks throughout the day, or learn to say “no” so you don’t constantly feel overwhelmed. Talk to a licensed counselor or doctor. If you’re experiencing chronic anxiety or stress that you simply can’t get rid of (death of a loved one, for example, or a divorce), or if you have suffered from a traumatic event (PTSD), make an appointment with your doctor or a therapist. There’s no reason to continue living in fear when someone can help you feel better. Vitamin B3 plays a role in the synthesis of serotonin. Vitamin B8 (inositol) has been found to help with anxiety disorders such as obsessive compulsive disorder. Vitamin B9 (folate) and vitamin B12 have been shown to aid in depression symptoms. While therapeutic doses of individual vitamins have benefit in alleviating anxiety symptoms, it is always a good idea to take a multi B-complex vitamin since the nutrients work best synergistically. Along with B vitamins, consider taking calcium and magnesium as these minerals help nourish the nervous system. While most people supplement somewhere between 400 to 600 mg of magnesium (and a corresponding 800 to 1,200 mg of calcium), evidence suggests you may need up to 1,000 mg daily of magnesium to help with panic attacks. Other natural remedies for panic attacks include vitamin D, omega 3 fish oil, oregano oil, 5HTP, valerian root, kava, and the essential oils lavender and bergamot. FDR once said, “The only thing we have to fear is fear itself.” Don’t let the fear of having another panic attack rage on. Begin making lifestyle adjustments—eliminating stressors and exercising regularly—and start using one or more of the natural remedies listed above. You can prevent panic attacks and start living an anxiety-free life! Prog Neuropsychopharmacol Biol Psychiatry. 2011 Jun 1;35(4):887-95. ISRN Psychiatry. 2013 Jan 21;2013:621453.
agoraphobia, anxiety, anxiety and depression, anxiety disorder, anxiety disorders, anxiety symptoms, b vitamins, b12, brain, calcium, chest pain, chronic anxiety, depression, depression and anxiety, depression symptoms, dizziness, exercise, fish oil, fitness, folate, generalized anxiety, generalized anxiety disorder, help with anxiety, lavender, long periods, magnesium, natural remedies, natural remedies for, natural remedies for panic attacks, neurotransmitter, nutrients, omega 3, oregano oil, overcoming anxiety, overwhelming anxiety, pain, panic attack, panic attack remedies, panic attack symptoms, panic attacks, panic attacks in women, panic disorder, ptsd, serotonin, shortness of breath, social anxiety, social anxiety disorder, social phobia, stress, supplement, symptoms of depression, symptoms of depression and anxiety, vitamin, vitamin b12, vitamin b3, vitamin d, vitamins, what is a panic attack, yoga for beginners. Very helpful and reassuring the fact that, I know others suffer. Vits, how many types do I take together? My Panic attacks occur at Night normally. Wake up not knowing what is wrong but have to get up instantly and walks around. Very frightening, Spooky. Cannot explain the feeling. John. I thought you might be interested in this article on https://universityhealthnews.com: What Is a Panic Attack?